As Shinzo Abe arrived in Canberra late Monday for what is the first official bilateral visit to Australia by a Japanese prime minister since 2002, he may have had two precedents in mind: one historical, the other familiar. In 1957, then Prime Minister Nobusuke Kishi, Abe’s grandfather, visited Australia to sign the Australia-Japan Agreement on Commerce, which not only opened up trade between the two countries but also ushered in a much more prominent international role for postwar Japan. More familiar would have been Abe’s own visit in 2007 to sign the Joint Declaration on Security Cooperation, elevating the bilateral relationship to a strategic partnership. 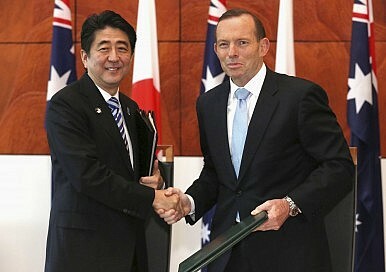 This time around, Abe sought to bring life to a new “special relationship” between Australia and Japan. The centerpiece was the signing of the Economic Partnership Agreement (EPA) by the two leaders, making Australia the largest economy and just the second developed country with which Japan has reached such an agreement. Though perhaps not as groundbreaking as the Commerce Agreement in its geopolitical impact, the EPA should offer much-needed momentum to the Japanese economy as TPP negotiations appear to languish and Abe finally sets about implementing his lengthy list of structural reforms. For Abbott, the economic benefits are obvious: duty-free access for more than 97 percent of Australian exports and a potentially huge inflow of capital from one of Australia’s largest investors. A delegation of Japanese business leaders accompanying Abe from such companies as Mitsubishi, Mitsui and Nippon Steel, are reportedly considering some significant investments in agribusiness, energy and services. With Chinese President Xi Jinping set to visit in November, Abbott will also be hoping to repeat something similar with China. But with the Japanese government having just passed a cabinet decision to allow the exercise of collective self-defense, all eyes were unquestionably focused on the security dimension of the visit. Conveniently picking up where Abe left things last time he was here, the two leaders signed a bilateral agreement on the transfer of defense equipment and technology. Along with the growing importance placed on practical military cooperation and joint interoperability, the new agreement looks set to pave the way for the joint development of submarine technology. Australia’s first project with Japan will be the Marine Hydrodynamics Project, led jointly by researchers at Australia’s Defense Science and Technology Organisation (DSTO) and Japan’s Technical Research and Development Institute. Of course, wherever Abe goes concerns about China tend to follow. In his address to a joint sitting of the Australian Parliament – a first for any Japanese leader – Abe was quick to dispel any notions of revanchist Japanese militarism, vowing that Japan is “determined to do more to enhance peace in the region and peace in the world.” Strengthening ties with Australia were a key part of this goal, he argued.